SAN SALVADOR, Mar 16 2018 (IPS) - Carrying a red plastic bag containing an old pair of shoes and a few other belongings, David Antonio Pérez arrives to El Salvador, deported from the United States. David Antonio, 42, is a divorced father of two who has lived in the U.S. for a total of 12 years. He has spent five years in detention facilities for undocumented immigrants in three cities of the state of California, because his immigration case was drawn out by the appeals he filed in an attempt to avoid deportation. “After being locked up for so long, my plans are to go outside. Now I want to go eat, and the rest of the afternoon I want to walk around and feel the freedom,” he tells IPS after completing the paperwork in the governmental Immigrant Assistance Centre, which operates under the Department of Migration and Alien Affairs (DGME) and is located on the east side of the capital. David Antonio is returning to El Salvador on a Wednesday, along with 96 other people, on one of the flights chartered by the US federal government, from Houston, Texas. “I have mixed feelings. 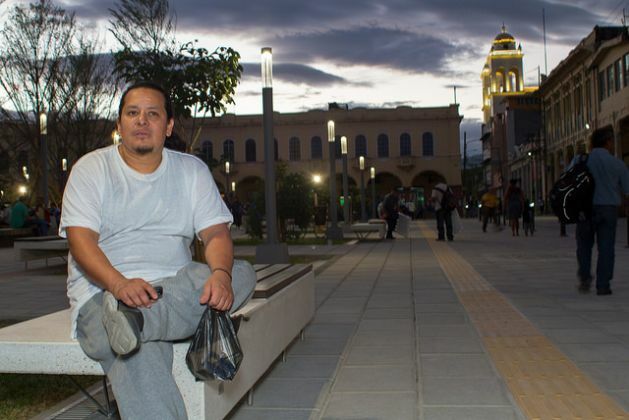 I’m happy to be back in the place where I was born, and because I’m free, but I did not want to come in these conditions,” says David Antonio, as he takes his first steps through the streets of San Salvador, looking for a place to buy a charger for his cell phone so he can communicate with his family. His children, aged 10 and 15, live in El Salvador with their mother. An estimated 2.8 million Salvadorans live in the United States – a diaspora that grew in the 1980s, when many fled the 1980-1992 civil war. 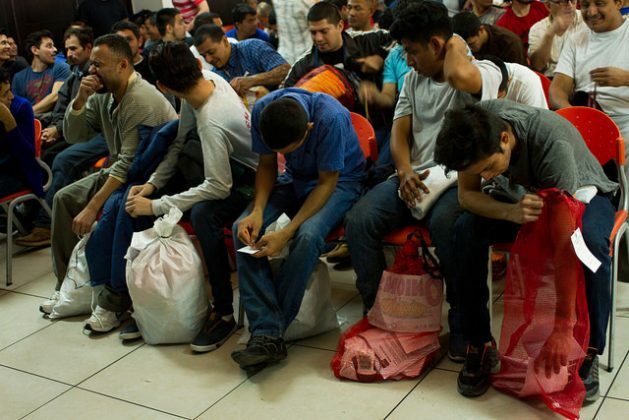 El Salvador, the smallest country in Central America but with the third-largest population – 7.3 million – is the Central American country with the largest number of migrants living in the U.S., according to United Nations data. At least three planes arrive every week from the United States, and three buses from Mexico, bringing back a weekly average of 460 deportees. Their dream of a better life turned into a nightmare the day that the “migra”, as the U.S. border patrol are known, or Mexican agents detained them and began deportation proceedings. Many arrive without even enough money to get back to their hometown. “Right now I’m seeing how I can get home, where my parents live, I have no money and I’m trying to find a ride at least as far as San Miguel,” another deportee tells IPS. Like many others he does not want to give his name because of the widespread belief that deportees have been sent home because they committed a crime, or the stigma that they have failed. San Miguel is the capital of the eastern department of the same name, and from there he’ll have to travel to Santa Rosa de Lima, his final destination, about 160 km from San Salvador. 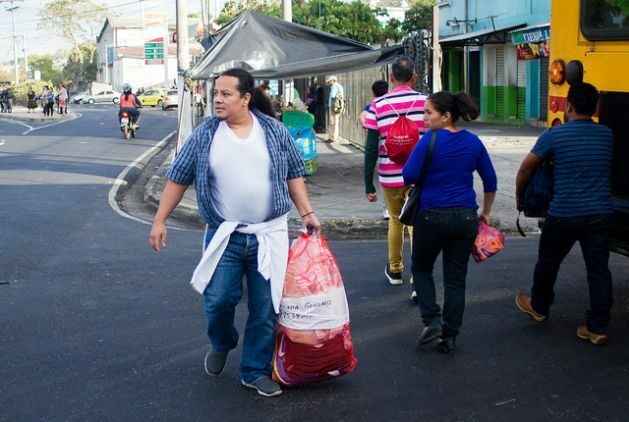 The staff at the centre provides food, free phone calls, transportation to the three bus terminals in San Salvador, clothes, toiletry kits and medical consultations, in coordination with doctors from the Ministry of Health, Krissia Borja, the head of the land return office in the DGME, tells IPS. In 2017, almost 27,000 people were deported from the United States and Mexico, which overall represents a 50.68 percent drop from 2016, according to official figures. Those arriving by road from Mexico, some 11,000, were detained in that country before they managed to cross the U.S. border. David Antonio, originally from San Salvador, says the social and economic conditions in his country do not offer encouraging prospects. Nevertheless, setting out on another hazardous journey to the U.S. as an undocumented migrant is not currently among his plans. He says that anti-immigrant policies of U.S. President Donald Trump do not encourage him to embark on new journeys to that country, after the three that he has already undertaken since 2002, which have ended in deportation each time. The fear of an increase in deportations has surged since the end of 2017, when it became clear that Trump’s Republican administration was about to terminate the temporary protected status (TPS) which protected nearly 200,000 Salvadorans in the U.S. since 2001. On Jan. 8, the elimination of the TPS was formally announced, leaving the beneficiaries of the programme in limbo, although they were given 18 months to seek a solution, and the U.S. Congress may come to their aid with a bill that would grant them permanent residency. However, the large-scale deportations that people are worried about because of this measure will not happen, analyst César Ríos, executive director of the non-governmental Salvadoran Migrant Institute (INSAMI), tells IPS. The expert calculates that, of the more than 190,000 people affected by the measure, some 30,000 could legalise their immigration status through the normal channels offered by the U.S. immigration system. The rest, however, could decide to stay in the United States as undocumented immigrants, or try to cross into Canada, as indicated by cases already reported since Trump took power in January 2017. While some will return to El Salvador, the flow will not be massive, said Ríos. Deportations, however, could increase, but of Salvadorans who have always been undocumented and who did not qualify for protection under the TPS – the great majority of the estimated 2.8 million Salvadorans in the U.S. This group may be affected if the raids and arrests of immigrants by U.S. authorities increase, which would affect the remittances sent home to their families, a vital part of the Salvadoran economy. Remittances sent back to El Salvador amounted to 5.021 billion dollars in 2017, which represented an increase of 9.7 percent compared to 2016, when they totaled 4.576 billion dollars, according to figures from the state-run Central Reserve Bank. Remittances account for 17 percent of the GDP of this Central American country. David Antonio has been deported twice before, since he first went to the United States in 2002. While he was there, he worked 16 hours a day in fast food restaurants. Now his future is uncertain. “There, for collecting trash in a park you get good pay. It’s not the same here, wages are extremely low,” he says. The minimum wage in El Salvador ranges from 200 dollars per month for sugarcane cutters and coffee bean pickers, to 300 dollars for those who work in services and industry. “I’ve been away from this country for a long time, I don’t have connections that can help me find a job,” said David Antonio. A lot of these people being affected could have become legal but would not put forth the effort. My wife is from El Salvador and has been a US citizen for 35 years!She did not let it slide but got Her legal status through legal means!Most could have done the same unless they had a criminal record! My wife and I have little sympathy for those who just rode the system!